I’ve seen a lot of fretting around the NYC scene that Bill de Blasio is going to be a disappointment as a mayor. I think many New Yorkers simply have PBSD (Post Bloomberg Stress Disease) — where the mere word “mayor” conjured up images of awkward Spanglish, 16 oz. sodas cans, Joel Klein /Cathie Black/ Dennis Walcott, and a variety of other traumas. So New Yorkers did the only thing they could possibly do — elect a mayor who was the very opposite of Mayor Mike. 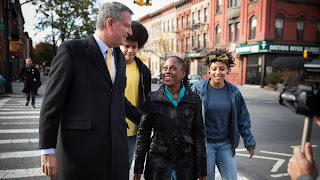 Mayor Mike was short, Bill de Blasio is NBA tall. Mayor Mike lived in a Park Ave. brownstone, Bill is moving to Gracie Mansion after having started his campaign in front of his modest Brooklyn row house. Mayor Mike stood for all sorts of things and Bill ran a campaign based on being against everything that was important to Mayor Mike. But now January 1st is less than two weeks away, Mayor Mike’s administration are cleaning their offices, and it’s like WHAT IF MAYOR BILL IS JUST AS BAD? Well, he can’t be as bad as Mayor Mike but what if he’s almost as bad? Mayor Mike showed so many ways to be bad as a mayor that people could fill up sheets and sheets with ways he’s bad, and still run out of room. Maybe you can fill up a whole library. Well, I found myself unceremoniously unemployed just in time for campaign season 2013, and soon spent 9, 10, 11 hours a day volunteering to elect Mayor Bill. They always say campaigns reflect a candidate’s personality. Mayor Bill’s campaign was disciplined, but easygoing, and reflected “real New York” — a quirky mix of people from all backgrounds and ethnicities. There were a few requirements — fans of Christine Quinn/Ray Kelly/Mayor Mike were not welcome (duh) but other than that, it was a diverse, fun group. I remember people staying late in the campaign office often just to chat and drink soda. But as election night neared, and polls showed him 40+ points ahead, a few of us diehard volunteers started to privately worry. We all worked hard, but none of us were rich, and we couldn’t even pretend to be well-connected. A big point was the Election Night party. Many of us said, “It’s going to be such a huge party with so many VIP’s, I bet we won’t even be allowed in.” “He’ll forget us as soon as the polls close.” The closer it got to election night, the gloomier the prediction. Then the night before the party, the diehard volunteers got an invitation: stand onstage with Bill when he’s elected. Instead of officials and VIP’s, he’d be onstage with the ordinary, not-well-connected, not-rich volunteers. Once we got the email many of us spent most of election day planning our clothes and makeup to look good on TV. After the post-election euphoria wore off, gloom again set in among the volunteers (by now all friends). Same insecurities, like … he’s Mayor Elect now. He hosted a big volunteer party not too long ago, with open bar and great food, and showed up to thank everyone. But it’s hard to convince a group of people that they won’t be forgotten, when so many politicians have done exactly that. (Cough, a certain president, cough). So we started to chat again on Facebook. We hoped for things and tried to sound pessimistic enough to hide the oncoming bitter disappointment. Again, who were we? A bunch of not-connected, not-rich, in many cases not-employed volunteers. Then … just in time for Christmas, it seems, all of us got our Inauguration invitations. Yes, the Mayor-Elect of New York City wants to be sworn in with the very group of ordinary New Yorkers who worked hard to elect him. A few of us (myself included) will be ushers that day. The rest will simply be freezing in the cold at City Hall, warmed only by layers of wool and the knowledge that a long, 12-year nightmare is over. I think it’s a beautiful way to ring in the New Year, and a new era.